Windows Server 2008 R2 will not be version 7 at all! 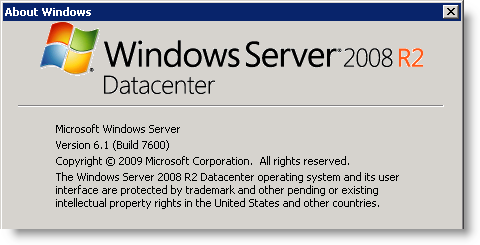 Actually, Windows Server 2008 R2 will be version 6.1. Will it still be binary compatible with Windows 7? Sorry about that folks… don’t panic, Windows 7 is version 6.1, too. Technically Windows 2008 R2 is classed as a “minor” or “update” release (2008 was the “major”). Even though I work there I still think it’s a bit more than minor as it includes a significant amount of new stuff (Branch Cache, Direct Access, Hyper-V R2, Core Parking, VDI Broker – the list goes on). Compare that with the Windows Server 2003 R2 release which I don’t think had anywhere near the level of additional functionality.